I enjoyed a wonderful evening tonight. Not only was the weather absolutely beautiful for patio dining, but I was able to experience something pretty historical! Tonight, on the patio at San Antonio’s Green Vegetarian Cuisine (my favorite restaurant), was a pop-up kitchen featuring the menu of Green’s soon-to-be spin-off restaurant, a vegan/vegetarian FAST FOOD joint, Earth Burger! Slated to open early this summer, Earth Burger will be Texas’ first plant-based fast food restaurant – San Antonio will be making Texas history very soon! Selecting what I wanted for dinner this evening was an extremely tough decision as everything on the menu sounded delicious. Ultimately I opted to go for the Spicy Chik-in sandwich which was just as awesome as I had dreamed. The chik-in not only looked 100% like real chicken, but I swear to you, in a blind taste test, it would be next to impossible to differentiate. No joke. And honestly, side by side, this plant-based “chicken” is actually probably tastier than the real thing anyhow (none of that nasty greasiness). I mean, take a look at the sandwich to the left… that doesn’t look like typical fast food, does it? And trust me, it tastes so much better too. The best part though? Knowing that this is a much healthier alternative to the current fast food options that we have. Earth Burger will even have healthy sides (hummus and carrots, kale salad, etc. ), although you can stick with the fries still if you want! 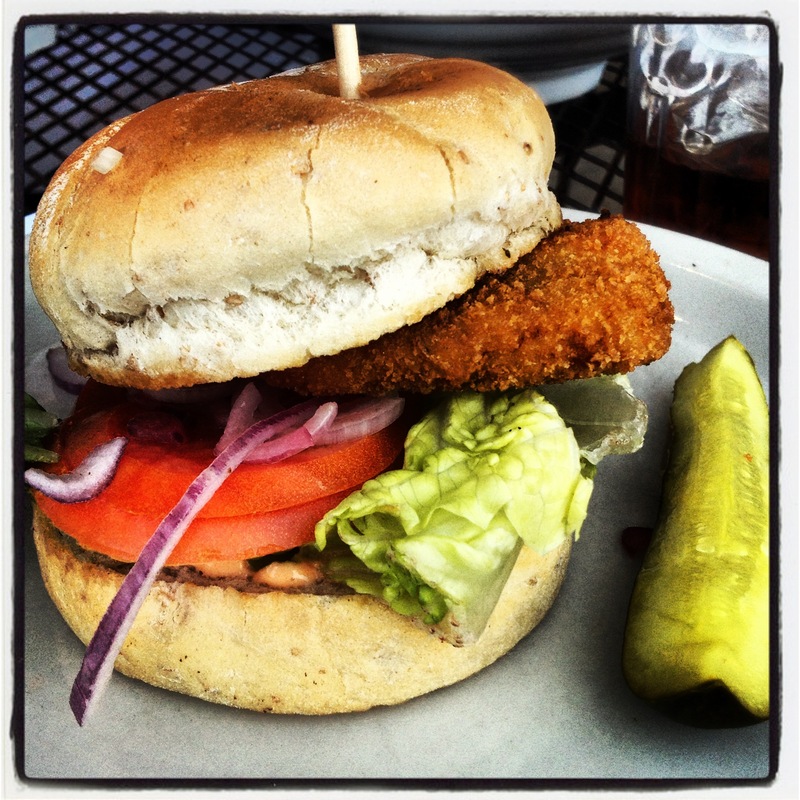 I also had the opportunity to try the Fish Sandwich. I know, I know. I was skeptical too. A fake FISH sandwich, WHAT?!? It was a very pleasant surprise though and far exceeded my expectations! I can’t wait to try the rest of the menu! And I’m looking forward to having a healthy, quick option for the kiddos (they will have drive-thru and dine-in)! So… even if vegan/vegetarian/non-meat/plant-based sounds scary to you… I challenge you to give this place a shot. It really is worth it in more ways than one! Next Wed, April 16th, they will be hosting one more pop-up kitchen at the Pearl Brewery location. Currently it’s set for 7-9pm, but check their Facebook page to make sure before you head out. Here’s the website for Earth Burger: http://www.EatAtEarthBurger.com. Also, they are running a Kickstarter campaign to help fund the restaurant and you can see that here: https://www.kickstarter.com/projects/1553374632/earth-burger-plant-based-fast-food?ref=live.